Opera Atelier works with over 1000 young people annually through our various workshops and guest instructing opportunities. Our goal is for participants in our programs to leave with a greater understanding of our particular art form, a deeper investment in the arts generally and our company specifically, and the feeling of empowerment that comes from learning in, through, and about the arts. By offering the majority of these programs free of charge, Opera Atelier aims to be as inclusive as possible, providing students from all backgrounds a real participatory opportunity that might not otherwise be possible. Opera Atelier has recently offered specialized programming for youth from the Blind and Partially Sighted and Deaf and Hard of Hearing communities. Please email Opera Atelier for more information. 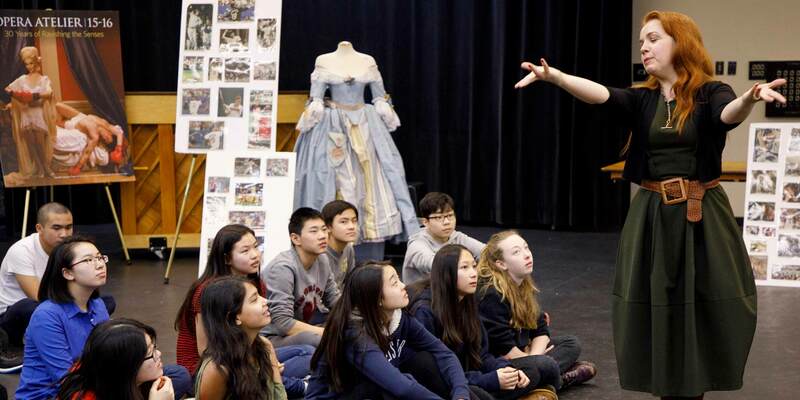 Since 1996, Opera Atelier’s Making of an Opera program has annually given more than 1,000 young people a one-day, once-in-a-lifetime opportunity to learn about, participate in, and experience the magic of opera, completely free of charge. Through an interactive workshop environment, school groups of students aged 12-18 have the opportunity to work with the professional team behind our productions to explore every aspect of opera. These workshops take place at the theatre or in the classroom. These interactive sessions culminate in students attending one of our productions for free, rounding out their multi-faceted experience. The social and historical context of opera, as interpreted in Opera Atelier’s productions. Key elements of musical style, with performances by Opera Atelier singers. Set design, looking at how materials, set painting, construction methods and lighting techniques are used to set the visual tone of a production. Stage fighting, with expert fight trainers guiding students through the basic techniques, complete with real stage swords and culminating in a performance by students. The fundamentals of Baroque dancing, taught by Opera Atelier’s Jeannette Lajeunesse Zingg, Choreographer/ Director of the School of Atelier Ballet and culminating in a dance performance by students. The Making of an Opera (MoaO) introduces students to the magical world of opera through a series of hands-on workshops at the historic Elgin Theatre. The week of one-day workshops takes place once each spring and once each fall, and is focused on the corresponding Opera Atelier production. Following the workshops students attend a performance at the Elgin Theatre and witness how all of these different components of the opera come together in a live show. In addition to learning what happens behind the scenes, Opera Atelier develops informative study guides for students to teach them about the art and its history. Teachers interested in bringing their students should contact us. The workshop is recommended for high school students, but may also be suitable for some grade 7 and 8 classes. School groups from all disciplines are welcome: Music, Drama, Dance, Visual Arts, History, Social Studies and Career Planning. What’s a day like at MoaO? Students and teachers arrive at the Elgin Theatre rehearsal space at 9:00 am, and participate in a fun-filled day of workshops and discussions about Baroque opera, ballet and performance. Please note that programming may change each session based on the production of focus and artist availability. Sessions fill up fast – teachers are advised to inquire about availability now to avoid disappointment. In 2008, Opera Atelier expanded its successful Making of an Opera program from a one-day workshop held at the Elgin Theatre into an in-school program specifically tailored to an individual student population’s needs. This affords us an incredible opportunity to cater to the individual needs of the student groups with which we are working, making their experience as rich, engaging and relevant as possible. We continue to strive to improve and expand our in-school program, crafting high-quality programming that relates specifically to the participating students. Please contact us if your school is interested in exploring a partnership with Opera Atelier through our Making of an Opera program.